Private Lessons are available on all instruments and in voice, composition, and jazz improvisation with Community Music School instructors and interns. For most instrumentalists the recommended age for beginning private study is age 7. Pianists and violinists may start at a younger age; for vocalists the recommended age is about 10. Click here for a complete list of lessons offered. Instructors are professional artist-educators who are Western New York’s most sought after teachers and performers. Interns are Eastman School of Music students who are among the best and brightest young performers in the world. 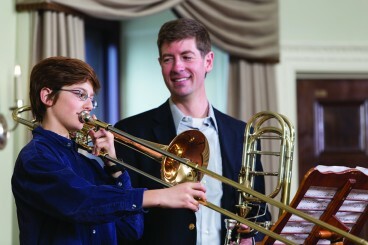 In addition to instructors and interns, some members of the Eastman School of Music collegiate faculty also offer lessons through the Community Music School; each sets his or her own individual fee. Call the Community Music School office for more details. School year tuition is billed in two semesters of 17 weeks each. Fall lessons are automatically re-registered for Spring semester, unless the student submits a written request to cancel before the semester begins. All quoted prices are per semester. Please complete the ECMS Registration Form for placement with a teacher. Lessons may begin any time of year. Each new student requesting lessons will be assigned to an intern or instructor. Requests for a particular teacher will be honored when possible. Once the assignment has been made, the teacher will contact the student directly to schedule lessons based on a mutually agreed upon lesson time and day. Students continuing lessons with their same teacher may register online from mid-May through Mid-September. Alternatively, continuing students may submit the ECMS Registration Form at any time. Click here for complete details on registration and policies. Summer is a wonderful time to continue lessons or try something new. During the fall and spring semesters students make a 17-week commitment to study. During the summer, students may make a commitment of any number of weeks they choose. If your teacher is available during the summer, students/parents may set up a schedule with their teacher based on mutual availability. No new Registration form is needed. If your teacher is not available, you may request a different teacher for the summer by completing the ECMS Registration Form. Students will be billed based on their total lesson time scheduled during the summer.